Hair straightening cream allows you to temporarily achieve a straight and smooth appearance throughout your hair. Hair straightening cream is heat activated. Simply distributing product through your hair before you blow dry your and style hair will get rid of all unwanted waves, curls or kinks, resulting in the hair you desire. Prepare your hair. 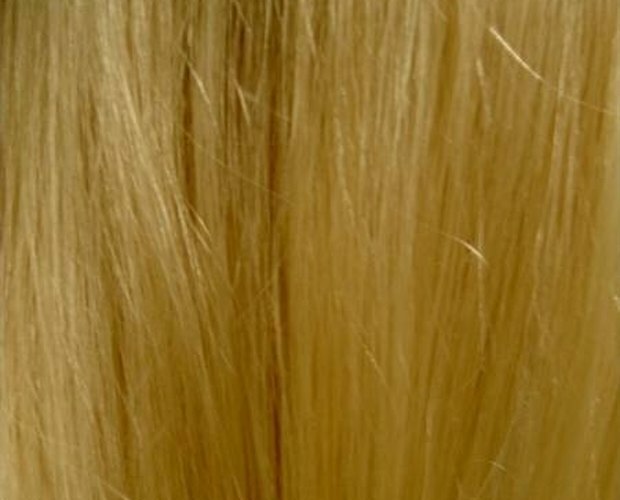 Before applying hair straightening cream, your hair should be clean. This will help the product to work more effectively. Once you have rinsed your hair thoroughly, scrunch your hair in a clean towel. Remove excess water from your hair until your hair is only damp. Brush through your hair with a bristle brush to remove all knots or tangles. Apply hair straightening cream to your hair. Squirt an amount of cream into the palm of your hand that is the size of a quarter. Always start out with a smaller amount than you will need. You can always add product, but you cannot take it away. Rub your hands together to spread out the product. Distribute the hair straightening cream evenly throughout your hair. Do this by brushing your hair with your fingertips. Start at your roots and then drag the product down the strands of your hair. Make sure to put minimal amounts of product near your roots to ensure your hair won't look greasy. Quickly brush through your hair once more with a bristle brush, to ensure the product has been effectively distributed. Section your hair. To do this, use three hair pins to section your hair into three different sections. It will make it easier to work with your hair. Place a thumb above each ear and move back creating a part between you under layer and top layer of hair. Section off the under layer of your hair with a pin. The remaining top layer of your hair will be split into two sections. Part your hair where you normally would, and then pin off two more sections accordingly. Blow dry your hair. Now that you have applied hair straightening cream to your hair, it will manage all waves and curls as you blow dry it into place. Use a round brush while blow drying your hair to attain a straighter smoother appearance. Work with one sectioned piece of hair at a time, starting with your bottom layer. Remove the hair pin from your bottom layer and place the round brush underneath your hair at the roots. Brush down your hair as you slowly turn the brush. As you do this, move the blow dryer along the hair, keeping the dryer over the brush. When blow drying your hair, the heat sets in place whatever shape your hair is. So, brushing your hair as you blow dry will imitate straight hair and therefore give your hair the appearance you desire. 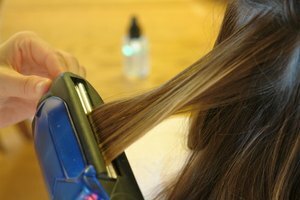 Continue brushing and blow drying the bottom layer until your hair is completely dry. Move to another section, and repeat until you have successfully dried all three sections of your hair.